Students who prefer more independent living can choose from a variety of University-owned and privately-owned off-campus living options. Conveniently located within walking distance of campus, University Apartments offers single undergraduates a variety of furnished units. 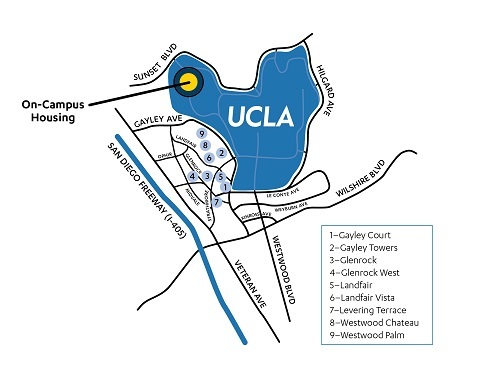 Five miles south of campus, UCLA’s University Village is designed especially for married students with or without children, students with same-gender domestic partners, and single parents. The Community Housing Office offers resources to students interested in finding different types of privately-owned housing in neighborhoods close to campus.